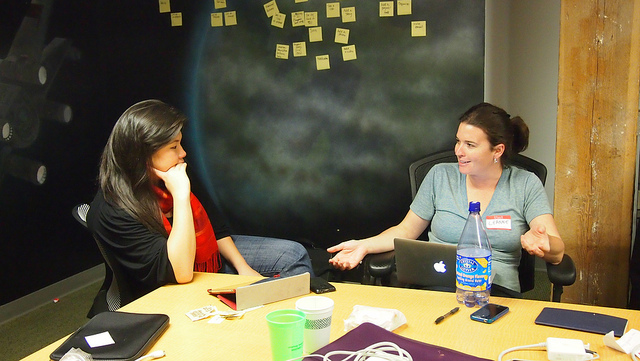 Pictured: Actual female programmers at Women 2.0 Startup Weekend, November 2011. Xeni posted last week about the EU's rather ridiculous "Science: It's a Girl Thing!" video, which was aimed at recruiting girls to science careers and, instead, hit enough vacuous stereotypes of femininity that it ended up seeming like a parody of itself. This seems like a nice moment to note that the Txchnologist website is currently posting articles in the theme of "Women in Science and Technology". One of those pieces is an interview with Margo Seltzer, an actual female scientist. Dr. Seltzer teaches computer science at Harvard University’s School of Engineering and Applied Sciences. Most science and technology professions have a hard time attracting and retaining women, and computer science is no exception. Only a quarter of employed computer scientists are women. Txchnologist asked Seltzer about her perspective on the problem, and what steps she thinks might help make computer science more female-friendly. Instead, Seltzer says, the problem is that computer scientists are portrayed in a negative way that doesn't fit who they really are—whether male or female. If we had a more well-rounded view of the wide variety of people that actually go into computer science, maybe more women could see themselves in that career. MS: I think the biggest factor is that as a society we’ve done a really, really bad job of marketing what it means to be in software. If you ask somebody, “What does a computer programmer look like?” I think almost everyone in the world will give you the same description—it’s a nerdy guy with no social skills and all he ever wants to do is program. The reality of the situation is very different. But the image that we’ve constructed societally is really pretty dreadful. You get articles about the problem and articles that discuss it, but you actually don’t get anyone portraying a different image very often. For a long time we’ve joked about the fact that we need an L.A.-Law-type show for computer programmers, where you have young, good looking, really fun, intelligent people who happen to be software engineers. If you look globally, there are countries where that isn’t the image, and in fact, their numbers are dramatically better. I was recently speaking with some of our Oracle engineers from China and they pretty much have a fifty-fifty split of men and women. And they think it’s sort of odd that we don’t. Read the rest of Margo Seltzer's interview. It's worth checking out the whole thing. In particular because she points out that this public image problem isn't the only problem. Even in the 21st century, many workplaces set policies that implicitly tell female employees, "You're not really welcome here." Maybe they're the ones who really need reminding that science can be a girl thing?